I’m sick of hearing that the adventure game genre is dead. It’s still there, lurking in the background of the scene, waiting for you to click on it – it’s just that your inventory is probably full of shooters. 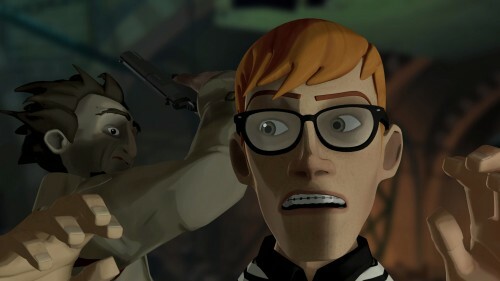 Telltale’s Sam & Max series, and their recent takes on Back to the Future and Jurassic Park, show there’s still an audience. 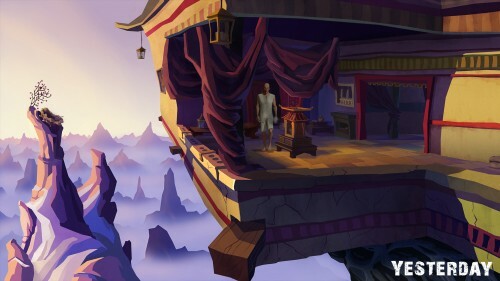 Hell, gamers have just thrown $3 million at Double Fine to make a new adventure. Meanwhile, Pendulo Studios have been working in the genre for years, releasing their latest title Yesterday yesterday. 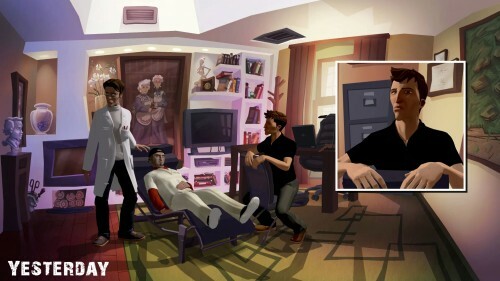 Yesterday is a pretty standard adventure game, but a very solid one. There’s little here you haven’t seen before, but it all works, and for a genre that isn’t common in today’s market, an adventure game that sticks to classic conventions is welcome. You know how an adventure game works: you click on objects in the environment, pick stuff up, combine inventory items and use them in obscure ways, worthy of old MacGyver episodes. That said, most of the time the solutions aren’t too obscure. Using a bit of adventure game logic (which is different to regular logic) will see a problem solved. When the puzzles do fall outside a normal person’s line of thinking, deduction can help – everything in each scene is there for a reason, and if you can interact with it, it’s important. If you have an item you haven’t used yet, chances are that’s the key to progressing. Regular scene changes keep your inventory from becoming too cumbersome: items picked up are usually required in that same scene, so you won’t have heaps to trawl through whenever you get stuck. There are times where the game dips into tedious trial and error, as you try to use every item you’re carrying with everything in the environment, until some bizarre combination triggers something. Thankfully though, if you do get stumped, there’s a hint system to get you through. Click the hint button once for a tip on which item is required for the next step – but not how to use it. If that’s not enough, a second hint will be more specific about what to do with it. If that’s too cheaty for you, a less direct help system is also included. Clicking a crosshair symbol in the toolbar briefly highlights the objects in the area that you can interact with. It doesn’t give away anything about how to use them, just lets you know that they can be examined, picked up or used in some way. I found myself using this feature a fair bit, as a mechanic rather than a “cheat” system. I don’t think it detracted from the game, although I could understand if purists choose to steer clear. Yesterday tells the story of one John Yesterday, who wakes up with, ironically, no memory of yesterday. All he recalls is that he recently tried to commit suicide in Paris, he’s an expert in Satanism, and he’s been hired to investigate a religious sect’s involvement in a spate of murders of New York’s homeless population. A life like that you’d assume one would remember, but it’s clear the memory loss is due to powers beyond his control. Most of the story revolves around figuring out who Yesterday is, why he attempted suicide, how he’s linked to the Satanic cult, and if that cult is responsible for the murders in New York. A protagonist with amnesia is very old-hat, but it frames the action surprisingly well. Objects you pick up or interact with can have memories attached, launching a cutscene or playable flashback. In fact, these flashbacks form a large chunk of the game: as Yesterday is filled in on earlier events by other characters, or remembers them himself, the game cuts to that scene and has you play it out. Flashbacks appear in a non-linear fashion – often, a scene won’t make sense until another flashback contextualises it. It makes for some confusing storytelling, but you are given all the pieces, you just have to put them into the right order yourself. Despite it’s interesting approach to narrative, there are elements that don’t quite work. Some lines of dialogue sound awkward, and certain plot points may be hard to swallow. Taken with a grain of salt though, the story is compelling and reasonably satisfying. Dealing with Satanism and torture, Yesterday is quite a bit darker than Pendulo’s previous games, but it isn’t completely devoid of humour. Some characters are purely there to provide comic relief, such as the seedy concierge at the Paris hotel and the fat American tourists in the antique shop. It’s never laugh-out-loud funny, but the inclusion of some grin-inducing characters is a welcome break in tone. The cel-shaded visuals might seem at odds with the darker tone, but it serves to convey meaning clearer. The characters are caricatured, with exaggerated facial features and expressions normally reserved for comedy. Strangely though, Yesterday himself has a face that just feels… off. It’s hard to explain why; he just looks like an early concept sketch that somehow made it into the final product. In dialogue scenes, we see close ups of the characters talking, but rarely do their faces contort in time with the voices. Instead, their jaws flap up and down like badly-timed Muppets. This could be a result of the English translation though: we might have a dubbed version of the original Spanish game. The environments are beautifully rendered and highly detailed, hiding interactive objects among background elements without making them too hard to find. Cutscenes are presented in a comic-book-style, with multiple windows into the action allowing several key aspects of a scene to be displayed simultaneously. 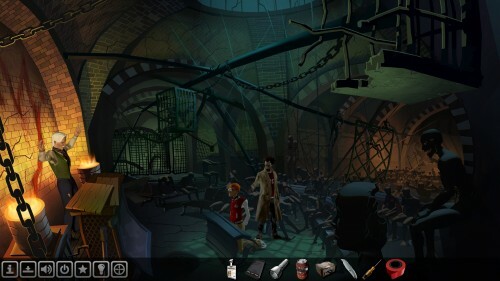 The comic book motif reappears during gameplay, as clicking on an item of interest in the environment brings up a window showing it close up. This is often the key to figuring out the item’s importance. Unfortunately, the sound doesn’t seem to have received the same amount of attention as the visuals. The voice acting varies in quality almost line-to-line. Most is serviceable, but some is pretty awful. The sound and music is nothing special, doing its job without drawing attention to itself. The stand out audio feature is the creepy tune Henry keeps whistling. It’s simple, memorable, eerie and often the first sign that all is not right. Yesterday is quite short, but provides a satisfying narrative without stretching it out too long. 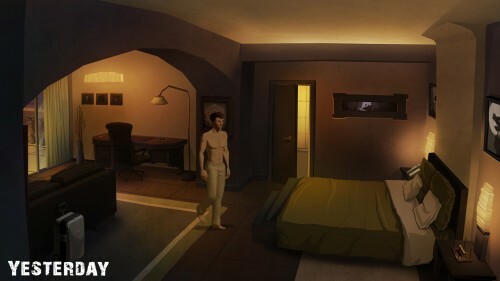 There may have been room for some extra polish, but with only minor issues, Pendulo Studios have delivered a solid adventure game with an intriguing plot.